[無料] Book Keeping Depository - Easy Accounting | Mac App Storeのアプリ検索・ランキング BuzzMac! Book Keeping Depository is a financial accounting app for your everyday financial operation. 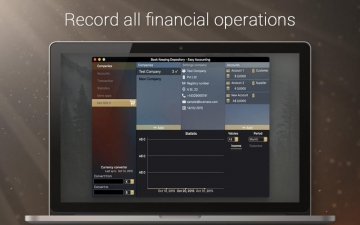 Maintain your company books and do all company and business accounting with ease. 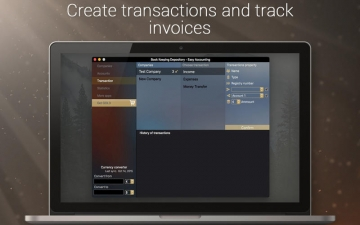 This app is based on professional accounting principles performed in a user-oriented form to allow you to work with invoices, display statistics, create transactions and so on. Manage your companies and accounts on the go and keep all the necessary information on hand, no specific bookkeeping knowledge are required. Book Keeping Depository provides a deep financial analysis with comprehensive reports, diagram and graphics in every window! There are the default company and sample accounts to show you how does this app work. First of all create your company account in the Companies tab using +Add button, enter all the necessary information and then add several accounts to record financial operations. You can create a new account in the Accounts tab in the left menu in that case you will have to select the created company to bound your account to, or select one of your companies in the Companies tab and click the +Add button to bound account automatically. 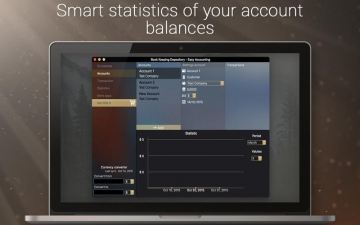 Enter the starting balance of the account and don't forget to select the currency. In the Transactions tab, you can create several types of the financial operations. Income or Expenses transactions require two accounts of different created companies and Money transfer can be carried out between any of them. Choose the currency of the transaction and enter the amount near. Statistics tab offers you a financial report in diagram and graphics, select the company, currency and the period of time.